Have you ever stopped to wonder why some dogs spend longer in rescue than others? Often it's simply bad luck, but everyone's luck has to change at some point, right? Meet Sci. 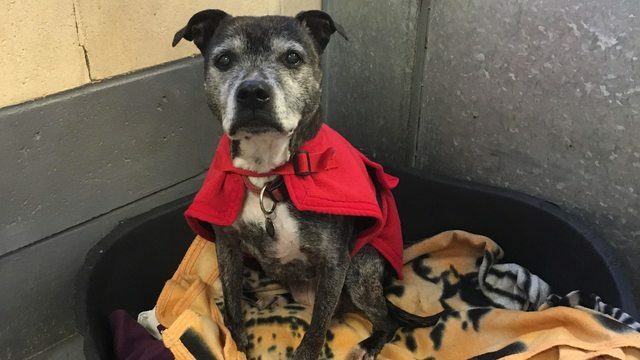 This girl is a little over 15 years old and she has spent more than 900 days (yes, more than THREE years) in kennels. Sci (aka Super Cute Individual) spent this time in the care of Social Services and she came to the attention of dog adoption site, dogsblog.com this week when her rescue shared her details asking the dog adoption site, which is sponsored by Direct Line Pet Insurance, to help her find a new home. Sci has been known to her rescue for the last three years and in that time they have been helping to care for her and exercise her. Although she has been thoroughly spoilt during this time, a kennels is no place for a dog of her age. Sci has now been signed over to RSPCA Essex South West and they can now help her. She deserves to find a place she can call home. A sofa she can curl up on, or a bed in front of a warm radiator. Somewhere which is hers, with people who care for her and she can care for in return. Her rescue say, "We absolutely adore this dog and have treated her as our own for all this time. She has now been signed over to us. "Sci is an old lady and we don’t know how long she has in this world, it could be weeks, months or even years. We want a permanent home where she can be loved, adored and cherished for the rest of her days. Sci is on a number of medications for arthritis and she has some other age related issues. She may or may not need regular trips to the vet." Sci is looking for a very special type of a home. Her rescue say, "This is the sort of home we are looking for: One with no other cats or dogs. We can talk more about other animals. She is ideally looking for a home with someone in most of the day – for example, a retired person or couple - without young children. "She needs a home with a garden and access to the garden with not too many steps, Sci won’t be able to do lots of steps but she would enjoy short walks. Her new owners need to be able to take her to the vet when needed and able to give daily medication. We will give advice on how to care for an elderly dog for her new owners to follow." UPDATE 20th Feb 2017 - Sci has found her forever home. Her rescue tell dogsblog.com, "We have been overwhelmed with applications from DogsBlog. Thank you for all your help and support as always and the extra efforts you put into advertising Sci." Clueless comments. The RSPCA have been looking after her for 3 years & are the people trying to find her a home. If only the people commenting on here actually knew the full facts of this case before spouting their opinions! Sci has been well cared for and has lots of people on her side. She’s a lovely old girl.